A recurring celestial drama is now underway. 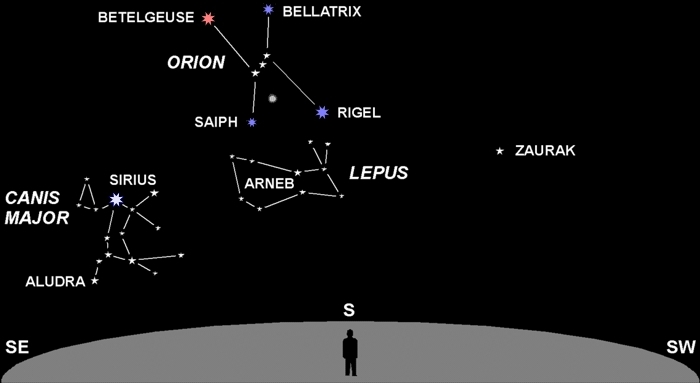 Every Winter through Spring, Orion (The Hunter) and his faithful companion Canis Major (The Big Dog) chase Lepus (The Hare) across the southern sky. The Hare is dimmest of the three, and you’ll need clear dark skies to even see it. But Canis, using her keen sense of smell, can track the Hare easily in the dark. Alas, after pursuing it tirelessly for eons, Big Dog has gained no ground on her prey. As with all constellations, they move in unison through the sky. Of etymological interest, the name “Sirius” translates as “scorching.” During July and August, Sirius is nearest the Sun (directionally, that is, not physically). The ancient Egyptians believed its added heat caused the long, hot days of that season. Sirius is alternatively known as the “dog star,” because of its host constellation. From there, we see the reasoning behind the term “dog days of summer,” used to describe the hot, sultry days of those months. Use of this term dates back at least as far as Aristotle. Canis Major and Orion contain five of the brightest stars in the sky. These stars are shown in color. All stars have subtle colors, but the human eye needs brightness to perceive it. If you take the time to look tonight, and compare Betelgeuse and Rigel, you’ll easily see the red vs. blue contrast. If you use binoculars, the colors will be even more apparent. These are all huge stars, tens to hundreds of times larger than the Sun! If you look just below the 3 stars that form Orion’s “belt,” you’ll see a fuzzy patch of light that almost looks like a small cloud. It is, in fact, a cloud of gas in outer space, some 1350 light years distant. Known as Messier 42 (M42), after the astronomer who first cataloged it, it’s a region where new stars are forming. Again, this is a good object for binoculars if you have them. 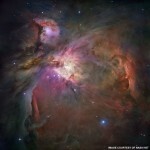 Click on the thumbnail below to see a spectacular Hubble Space Telescope (HST) photo of M42. Unfortunately, your eyes won’t see anything near the detail and color in that NASA image, even if you use a telescope, but it’s still well worth a look. So go outside tonight after it gets really dark, and enjoy the assembled celestial display. You don’t need a telescope (or even binoculars) to start learning astronomy. All you need are your eyes, clear dark sky, and a little natural curiosity. And tonight you can learn at least two constellations and five bright stars.